Can Abundance and Scarcity Clash? Al-Banna, Ali. Al-Moshkilat Al-Bee’iya wa Sinayat Al-Mawared Al-Tabiy’eiya (Environmental Problems and Safeguarding Natural Resources). Cairo: Dar Al-Fikr Al-Arabi, 2000. Amery, Hussein A., and A. A. Kubursi. 1992. “Le Litani Cle de la Renaissance Economique et de la Stabilite Politique du Liban.” Ecodecision. September, 55-57. Amery, Hussein A. “Water Security as a Factor in Arab-Israeli Wars and Emerging Peace.” Studies in Conflict & Terrorism. 20:95-104, 1997. Amery, Hussein A. “Water Wars in the Middle East: A Looming Threat.” The Geographical Journal. Vol. 168, No. 4, December 2002, pp. 313-323. Ben Shaul, D. 1990. “Divvying up the Drops: Israel Contends with Water Scarcity.” Israel Scene. June: 5-6. Blanford, Nicholas. “Water Dispute in an Arid Region.” The Christian Science Monitor. http://search.csmonitor.com/durable/2001/08/03/p6s1.htm August 3, 2001. Bleier, Ronald. “Will Nile Water Go to Israel? North Sinai Pipelines and the Politics of Scarcity.” Middle East Policy. September 1997, Vol. V, Number 3, pp. 113-124. Buzan, Barry, Ole Waever, and Jaap de Wilde. Security: A New Framework for Analysis. Boulder: Lynne Rienner Publishers, 1998. Deudney, Daniel H. and Richard A. Matthew, eds. Contested Grounds: Security and Conflict in the New Environmental Politics. Albany: State University of New York Press, 1999. Haddadin, Munther J. “Water in the Middle East Peace Process.” The Geographical Journal. Vol. 168, No. 4, December 2002, pp. 324-340. Isaac, Jad. “The Essentials of Sustainable Resource Management in Israel and Palestine.” Arab Studies Quarterly. Belmont: Spring 2000 Vol. 22, Iss. 2, p.13. Online. ProQuest. May 6, 2004. Joffe, Alexander H. “Drug Production and the Environment in Lebanon.” Middle East Intelligence Bulletin. http://www.meib.org/articles/0010_l1.htm 5 October 2000. Khalidi, Walid. Conflict and Violence in Lebanon: Confrontation in the Middle East. Cambridge, MA: Center for International Affairs, Harvard University. 1979. Lowi, Miriam R. The Politics of Water Under Conditions of Scarcity and Conflict: The Jordan River and Riparian States (Israel, Lebanon, Syria). Diss. Princeton U, 1990. Online. Dissertation Abstracts. 5 May 2003. Makdisi, Karim S. Trapped Between Sovereignty and Globalization: Implementing International Environmental and Natural Resources Treaties in Developing Countries – The Case of Lebanon. Diss. Fletcher School of Law and Diplomacy, 2001. Online. Dissertation Abstracts. 5 May 2003. Nachmani, Amikam. “Water Jitters in the Middle East.” Studies in Conflict & Terrorism. 20:67- 93, 1997. Pathak, Monika. “Water Wars Over Litani River.” Asian Profile. Vol. 27, No. 2. February 1999. pp. 181-186. Priit, J. Vesilind. “Middle East Water Critical Resource.” National Geographic. 185(55): 62. Selim, Mohammad El-Sayed. “Environmental Security in the Arab World.” AFES-PRESS. http://www.afes-press.de/pdf/Selim_Mont_4.pdf 20 March, 2004. Simon, Steven and Jonathan Stevenson. “The Road to Damascus.” Foreign Affairs. NewYork: May/June 2004. Vol. 83, Iss. 3; p.110. Online. ProQuest. May 6, 2004. Sosland, Jeffrey Karl. Cooperating rivals: The Politics of Water Scarcity, Protracted Conflict, and Complex Cooperation in the Jordan River Basin (Israel, Syria,Lebanon, Palestine). Diss. Georgetown U, 1998. Online. Dissertation Abstracts. 5 May 2003. Sunderlin, William. Ideology, Social Theory, and the Environment. Lanham: Rowman and Littlefield Publishers, 2003. Wanna, Butros. “U.S. Expert Inspects Wazzani River Water Pumping Project in South Lebanon.” Environmental News Network. http://www.enn.com/extras/printer- friendly.asp?storyid=48444 September 17, 2002. Wihbey, Paul Michael and Ilan Berman. “The Geopolitics of Water.” Institute for Advanced Strategic and Political Studies Research Papers in Strategy. http://www.iasps.org.il/strat10/strat10.htm September 2000. Amery, Hussein A. “Water Security as a Factor in Arab-Israeli Wars and Emerging Peace.” Studies in Conflict & Terrorism. 20:95, 1997, p 95. Amery, Hussein A. “Water Security as a Factor in Arab-Israeli Wars and Emerging Peace.” Studies in Conflict & Terrorism. 20:95-104, 1997, p 100. Amery, Hussein A., and A. A. Kubursi. 1992. “Le Litani Cle de la Renaissance Economique et de la Stabilite Politique du Liban.” Ecodecision. September, p 55-57. Amery, Hussein A. “Water Wars in the Middle East: A Looming Threat.” The Geographical Journal. Vol. 168, No. 4, December 2002, p 317. Also,see Wachtel, Howard M.
“The Intersection of Food and Water Security: A Case Study of the Near East.”http://www.american.edu/cas/econ/faculty/wachtel/intersection.pdf May 6, 2004.
proxy attacks on Israel”, in: Simon, Steven and Jonathan Stevenson. “The Road to Damascus.” Foreign Affairs. New York: May/June 2004. Vol. 83, Iss. 3; p.110. Online. Amikam. “Water Jitters in the Middle East.” Studies in Conflict & Terrorism. 20:67-93, 1997, p 68, and note 5 p 89. Extensive bibliography of Arabic literature on environmental security can be found in Selim, Mohammad El-Sayed. “Environmental Security in the Arab World.” AFES-PRESS. Case of Lebanon. Diss. Fletcher School of Law and Diplomacy, 2001. Online. Dissertation Abstracts. 5 May 2003. p 10. Also, see Selim, Mohammad El-Sayed. “Environmental Security in the Arab World.” AFES-PRESS. http://www.afes-press.de/pdf/Selim_Mont_4.pdf 20 March, 2004, p 20. See also Winnefeld, James and Mary E. Morris. Where Environmental Concerns and Security Strategies Meet: Green Conflict in Asia and the Middle East. Santa Monica: RAND, 1994, p 51. The chapter also includes an interesting expanded version of the Homer-Dixon model as it applies to the Middle East context, on p 53. Selim, Mohammad El-Sayed. “Environmental Security in the Arab World.” AFES-PRESS. http://www.afes-press.de/pdf/Selim_Mont_4.pdf 20 March, 2004, p 14. Buzan, Barry, Ole Waever, and Jaap de Wilde. Security: A New Framework for Analysis. Boulder: Lynne Rienner Publishers, 1998, p 89. 18 Ibid, p 90. Selim, Mohammad El-Sayed. “Environmental Security in the Arab World.” AFES-PRESS. http://www.afes-press.de/pdf/Selim_Mont_4.pdf 20 March, 2004, p 9-10. Ibid, p 18. 21 Ibid. 22 Ibid, p 2-4.
and its applicability to treaty compliance in developing countries such as Lebanon. 26 Ibid, p 4. Buzan, Barry, Ole Waever, and Jaap de Wilde. Security: A New Framework for Analysis. Boulder: Lynne Rienner Publishers, 1998, p 85. Selim, Mohammad El-Sayed. “Environmental Security in the Arab World.” AFES-PRESS. http://www.afes-press.de/pdf/Selim_Mont_4.pdf 20 March, 2004, p 10. Amery, Hussein A. “Water Wars in the Middle East: A Looming Threat.” The Geographical Journal. Vol. 168, No. 4, December 2002, p 319. Wihbey, Paul Michael and Ilan Berman. “The Geopolitics of Water.” Institute for Advanced Strategic and Political Studies Research Papers in Strategy. Winnefeld, James and Mary E. Morris. Where Environmental Concerns and Security Strategies Meet: Green Conflict in Asia and the Middle East. Santa Monica: RAND, 1994, p 34. Joffe, Alexander H. “Drug Production and the Environment in Lebanon.” Middle East Intelligence Bulletin. http://www.meib.org/articles/0010_l1.htm 5 October 2000. 34 Ibid. Winnefeld, James and Mary E. Morris. Where Environmental Concerns and Security Strategies Meet: Green Conflict in Asia and the Middle East. Santa Monica: RAND, 1994, p 35. Winnefeld, James and Mary E. Morris. Where Environmental Concerns and Security Strategies Meet: Green Conflict in Asia and the Middle East. Santa Monica: RAND, 1994, p 35. 38 Ibid. 39 Ibid, p 40. Case of Lebanon. Diss. Fletcher School of Law and Diplomacy, 2001. Online. Dissertation Abstracts. 5 May 2003. p 7. 41 Ibid, p iv. Blaikie, Piers and John Mope Simo, “Cameroon’s Environmental Accords: Signed, Sealed, but Undelivered,” in Ibid, p. 1-2. 43 Ibid, p 43-85. Studies in Conflict & Terrorism. 20:67-93, 1997, p 93. Desalinization, which is still in its infancy, may help produce more usable water, but the basic problem remains the overall management and use of water. Wolf, A. T. ‘Hydrostrategic Territory in the Jordan Basin in Amery, Hussein A. “Water Wars in the Middle East: A Looming Threat.” The Geographical Journal. Vol. 168, No. , December 2002, p 313. Amery, Hussein A. “Water Wars in the Middle East: A Looming Threat.” The Geographical Journal. Vol. 168, No. 4, December 2002, p 313. 49 Ibid. Palestine). Diss. Georgetown U, 1998. Online. Dissertation Abstracts. 5 May 2003. Lowi, Miriam R. The Politics of Water Under Conditions of Scarcity and Conflict: The Jordan River and Riparian States (Israel, Lebanon, Syria). Diss. Princeton U, 1990. Online. Dissertation Abstracts. 5 May 2003. Bleier, Ronald. “Will Nile Water Go to Israel? North Sinai Pipelines and the Politics of Scarcity.” Middle East Policy. September 1997, Vol. V, Number 3, p 113-124. Haddadin, Munther J. “Water in the Middle East Peace Process.” The Geographical Journal. Vol. 168, No. 4, December 2002, p 331. Amery, Hussein A. “Water Wars in the Middle East: A Looming Threat.” The Geographical Journal. Vol. 168, No. 4, December 2002, p 316. 55 Ibid. 56 Ibid. Haddadin, Munther J. “Water in the Middle East Peace Process.” The Geographical Journal. Vol. 168, No. 4, December 2002, p 330. Amery, Hussein A. “Water Wars in the Middle East: A Looming Threat.” The Geographical Journal. Vol. 168, No. 4, December 2002, p 318. Amery, Hussein A. “Water Wars in the Middle East: A Looming Threat.” The Geographical Journal. Vol. 168, No. 4, December 2002, p 320. Amery, Hussein A. “Water Wars in the Middle East: A Looming Threat.” The Geographical Journal. Vol. 168, No. 4, December 2002, p 320. 64 Ibid. 65 Ibid. 67 Ibid. Haddadin, Munther J. “Water in the Middle East Peace Process.” The Geographical Journal. Vol. 168, No. 4, December 2002, p 326. 69 Ibid, p 337. Amery, Hussein A. “Water Wars in the Middle East: A Looming Threat.” The Geographical Journal. Vol. 168, No. 4, December 2002, p 317. Ibid, p 322. 72 Ibid. Haddadin, Munther J. “Water in the Middle East Peace Process.” The Geographical Journal. Vol. 168, No. 4, December 2002, p 337. Nachmani, Amikam. “Water Jitters in the Middle East.” Studies in Conflict & Terrorism. 20:67-93, 1997, p 88. ISNAD ZEIDAN, Sami . "Can Abundance and Scarcity Clash? Environmental Security in Lebanon’s Second Republic". 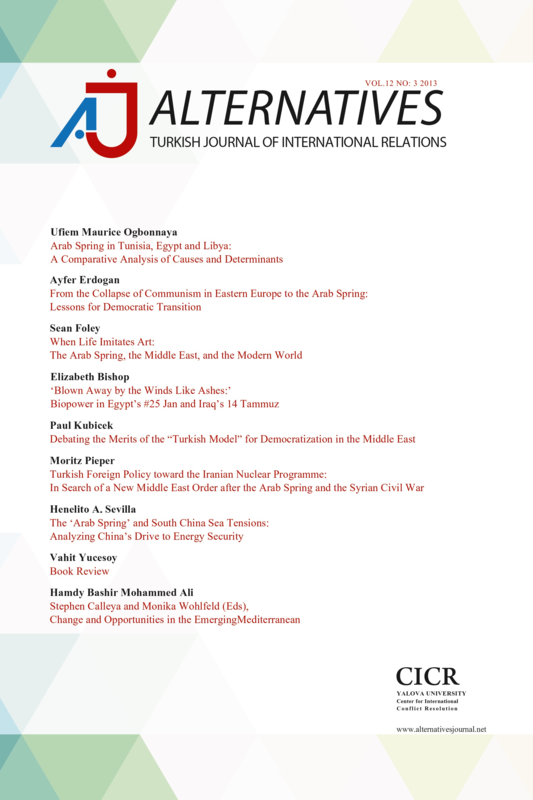 Alternatives: Turkish Journal of International Relations 4 / 4 (December 2005): 1-15.